Most of us have heard of the rule of 72. If you are paid an interest rate of say 6%, then it takes about 12 years to double your money. The “rule of 72” part comes from 6 times 12 equals 72. Similarly, it would take only about 8 years at 9% interest. However, this so-called rule is just an approximation. The rule of 72 turns out to be exactly accurate at about 7.85%. But up at around 26%, it should be called the rule of 78. Down around 1% or 2%, it should be called the rule of 70. 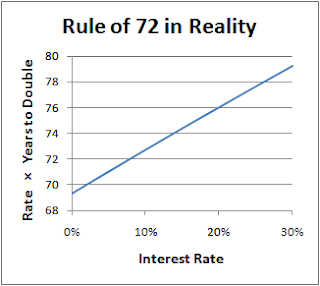 Blindly applying the rule of 72 for interest rates of 1% and 2% gives answers that are slightly off. The real times to double your money are about 70 and 35 years rather than 72 and 36 years. This kind of error certainly isn’t a big deal when doing back-of-the-envelope calculations, but I prefer to know when rules are accurate and when they are just approximations. In the limit, at 0%, you approach 69.3, which is why 69.3 log points corresponds to a factor of two. What's the doubling rate for 0.05% interest? When pigs fly or when hell freezes over? It's funny, though, I think I have a chequing account that pays 0.05%, yet I feel ripped off when my brokerage account pays 0%. I think that infinitesimal amount of interest placates people. @Gene: I'm not sure whether pigs will fly or hell will freeze over in 1387 years. 4% and 4.5% is a yawn.